This story was updated at 10 p.m. EST. MOJAVE,Calif. ? It was pre-soldas an ?out of this world premier? ? and you can?t get more off-world than Virgin Galactic?sMonday unveiling of a spaceliner built to whisk customers to the edge of space. SpaceShipTwomade its debut here today ? a super-slick looking rocket plane showcased as the world?s firstpassenger-carrying commercial spacecraft. The enterprise is under the financialwing of well-heeled U.K. billionaire and adventurer Sir Richard Branson and hisspace tourism firm Virgin Galactic.? Some 800onlookers were treated to the rollout ceremonies ? an event that took place in a verycold, windy, and near-snow desert environment here at the Mojave Air and SpacePort. Still, attendees were treated to a glittery and spectacular site ? the public unveiling of SpaceShipTwo,slung underneath its carrier aircraft. At therollout, New Mexico Governor Bill Richardson was joined by California GovernorArnold Schwarzenegger for the honor of christening SpaceShipTwo as Virgin SpaceShip (VSS) Enterprise. ?I have totell you that there?s a lot of cool things you get to do when you?re Governor,said Schwarzenegger. ?But today is one of the coolest things that I?ve everdone.? Schwarzeneggersaid that ?space is our next great frontier,? and pledged to keep California inthe forefront of space enterprise as the ?aerospace capital of the world.? TheSpaceShipTwo project has already created hundreds of jobs here and will createhundreds of more jobs, he noted. Branson hasbilled Virgin Galactic as the world?sfirst commercial spaceline. The scene waspart desert scenery, part festival, part Hollywood glitz ? but full-time entrepreneurial spacespunk. It?s the home base for several privately-held ventures eager to change thelandscape of accessto space. Today?s festivitieswere held within a specially-built and spectacularly lighted complex thatincluded two huge domes, tents and other structure. 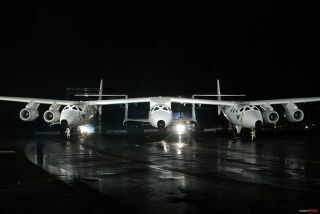 WhiteKnightTwo carriedSpaceShipTwo onto the tarmac to the delight of onlookers in awell-orchestrated, music and audio extravaganza. Bothvehicles have been designed and built by Scaled Composites, based at the MojaveAir and Space Port and founded by rebel aerospace designer, Burt Rutan, now Chief Technology Officer andChairman Emeritus of the aerospace firm. ?I want tosay that this program has been, at this point, harder than we thought it wouldbe. It?s taken longer and is more difficult,? Rutan admitted, saluting Bransonfor sticking with the project. ?This is an enormous milestone today inunveiling the first commercial manned spacecraft. I look forward to moving intothe test program,? he said at rollout ceremonies. Next yearwill mark a major shakeout of the SpaceShipTwo, said Rutan. ?We?ll docaptive carry, glide tests?then rocket-powered flights and then open theenvelope and fly to space,? he added. Rutan madeclear his admiration for the Scaled Composite team that has crafted WhiteKnightTwoand SpaceShipTwo ?a true commercial suborbital space system: Designers Jim Tighe, Bob Morgan,Matt Stinemetze, Marc Zeitlin, and Peter Kalogiannis in avionics, along withdesign and assembly teams ?that have worked long and hard for this milestone,?he told SPACE.com. TheWhiteKnightTwo aircraft, on its own, is a milestone-making design. That craftwas revealed to the public in July 2008 and has been undergoing extensivetesting ? alreadychalking up 22 flights with more to come on the books. The plane,looking like a flying catamaran, is the world?s largest all carbon compositeaircraft and many of its component parts have been built using compositematerials for the very first time. But todayit was show time for SpaceShipTwo. Bransonsaid that he was nearly reduced to tears in first seeing the SpaceShipTwo duringhis current visit to the Mojave Air and Space Port. The suborbitalSpaceShipTwo is a six-passenger and two-pilot craft. It received one final buffbefore its early evening, red carpet entrance. Throughout 2010, the rocketplane will undergo a far-reaching and all-encompassing test agenda. ?This isthe world?s first manned commercial spacecraft. I think for 40 years peoplehave dreamed of this?but they have increasingly believed that it just wasn?tgoing to happen,? said Will Whitehorn, president of Virgin Galactic. Whitehornflags economics over those years that have defeated commercial spaceflight,?because there?s been no direction shown in government rocketry towards thekind of future of people being able to go into space regularly and easily,? hetold SPACE.com. The modelsof the space plane have never done it justice, Whitehorn observed. ?When peoplesee for themselves SpaceShipTwo?this spaceship looks robust, fit for purposeand looks very safe. It looks like something you?d imagine getting into. Whenyou see it?it kind of looks just right.? ?It?sreally here. It has been done. This has been five years of extremely hard work.The result is something quite utterly unique. For us, space tourism is a goodgoal in its own right because it will create the circumstances of regularityand safety. And that will give the confidence for the kind of wall of privatesector investment I do see coming into space launch in the future.? For thecrowds gathered here today, there was an expectation of viewing a milestone inaerospace technology, the dawn of privatespace launch, for humans, science research and payloads. Thatanticipation rang true for Stuart Witt, General Manager of the Mojave Air andSpace Port. He?s been busy directing the expansion of Mojave?s East KernAirport District?s to handle the goings and comings of privately-builtspaceships. The MojaveAir and Space Port was designated by the Federal Aviation Administration?scommercial space office as the nation?s first inland spaceport and played hostto the world as Scaled Composites qualified and won the $10 million Ansari XPrize at the sprawling complex ? the birthplace of the first human-rated commercial spaceprogram in the world. Today, therollout of SpaceShipTwo signals another step forward in public space travel,Witt noted. ?This eventunderscores once again that the private sector with small teams can achieverapid quantifiable results. Something on the order of 100 people produced thesetwo new craft, SpaceShipTwo and the WhiteKnightTwo,? Witt explained. It has beenhistorically proven, Witt said, that humanity requires risk takers to open newfrontiers leading to safety breakthroughs for all humankind. That goes forocean as well as air exploration, he added. ?Magellanor Lindbergh come to mind?one opened the sea to world exploration, the otherput a spotlight on air travel,? Witt said. ?It is time for the private sector tocommercialize access to space in a big way.? Witt saidthat he is heartened to see people of means and vision come together with thosethat have demonstrated engineering genius. That melding yields bold newconcepts. ?The privatesector aviation industry has produced a transportation safety record?and it isvery likely the private sector can deliver similar results in space travelthrough the commercialization of space,? Witt concluded. Similar inview is Steve Landeene,Executive Director ofNew Mexico?s Spaceport America ? the home launch site for Virgin Galactic?scommercial operations. ?The dawnof commercial space is upon us,? Landeene told SPACE.com. ?This is no longer a paper promise?but hardware andinfrastructure that changes the way we will access space forever.? ForLandeene, The SpaceShipTwo roll-out ?signifies the birth of a new mode oftransportation.? New MexicoGovernor Richardson saluted the WhiteKnightTwo and SpaceShipTwo effort,pointing out that work in establishing Spaceport America is well underway. Adeal struck between Branson and Richardson in 2006 is leading to the locationof Virgin Galactic?s world headquarters in New Mexico. In NewMexico, there is a flurry of activity getting Spaceport America ready for thefirst space tourists, Richardson said. Constructionof New Mexico?s Spaceport America?s runway is rapidly taking shape, employingmore than 200 people. Construction of Virgin Galactic?s Hangar-Terminal is setto get underway soon. The majority of construction is set to be completed byDecember 2010. ?My stateis energized and raring to go. We?re proud to be on the ground floor of thesecond space age,? Richardson said. ?I call upon the Obama Administration toembrace commercial space travel,? he concluded.